In the colder months of the year a little indulgence is allowed, don’t you agree? 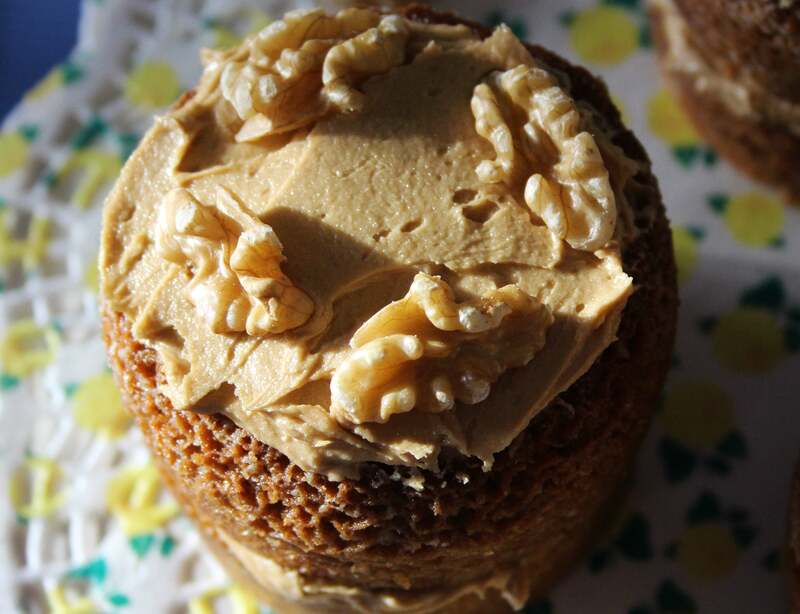 And coffee flavoured buttercream is most definitely that; a luxurious indulgence. This cake is apparently British in origin, and when I was young my Mum used to make it using Camp coffee essence… not sure if that is still readily available, but my recipe uses a good dose of instant (decaffeinated) coffee granules and is just as good. You will need either two 20cm sponge cake tins, greased and floured, or a mini sponge cake tin – mine makes six which are then sliced through the middle horizontally. You could of course make cupcakes in a muffin pan too, but you’ll need less buttercream then I think. For the cake, dissolve the coffee first, so it can cool. Cream the butter and sugar with a mixer until light and fluffy. Then beat in the eggs, one at a time. Add the coffee and then gently fold in the flour with a metal spoon. Finally stir in the chopped walnuts. Now you need to have a soft mixture that will just about drop off a spoon – add the milk to reach the right consistency. Divide between your cake tins and then bake for about 25 minutes. Check the middle is done with a cocktail stick or something similar, as it may need a few more minutes. When cooked, leave in the tins for a few minutes before turning out onto a wire rack to cool. When the cakes are completely cool, spread the buttercream over the base and place the other half on top. Then use the remaining buttercream for decoration on the top, adding a few walnut halves/quarters too. These are just as delicious with a cup of tea as they are with coffee! What foods do you like to indulge in during the winter months? This entry was posted in Food, Recipes, Traditions and tagged Food, Recipes, Traditions, Vegetarian. Bookmark the permalink. These used to be one of my favourites when I was a child, I think I would still like them now, you’ve inspired me to make them again. They look naughty and very nice. Will have to give your recipe a go. For me fruit, ideally rhubarb, crumble and vanilla ice cream is a real Winter treat. Ooh yes, a crumble would be a good idea this weekend as I still have some of last year’s rhubarb in the freezer to use up! Did you ever try carob flower instead of cacao? You can get it here in health food stores and it’s supposed to be much more healthy than cacao and has a wonderful taste. I make muffins with carob flower and they taste really good. I’ve never tried it, but if I see some I’ll buy it and try it in muffins. Thanks for the tip Mitza, and have a good weekend! Lovely, I haven’ t tasted coffee cake for years. This is one of those cakes that gets me reminiscing, as I used to choose this if we went out to a cafe in the UK. Either this or carrot cake with cream cheese topping. 🙂 German cakes in comparison tend to be very creamy complicated affairs! We all love coffee and walnut cake here Cathy and Camp coffee is still available, yours look really pretty as mini cakes too, I shall try that next time. I’ve indulged too much this winter and am now trying to be more disciplined. Me too Julie. I’ll try and post a healthy recipe for Lent soon! 😉 By the way, we had the other 3 defrosted cakes on Sunday and they were just as good – so freezing is no problem at all. Yes, us too. 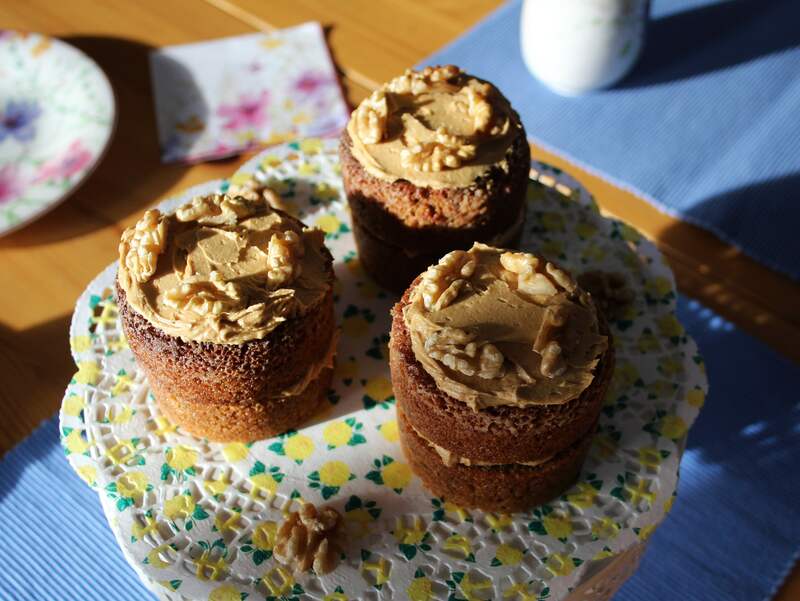 I make coffee & walnut cakes a lot as walnuts grow here in abundance. Our other BIG indulgence is chocolate brownie, with walnuts, of course! Can’t be beaten with morning coffee! Brownies are something really special and I rarely make them as they are just too much of a temptation! 😉 I love them with walnuts in too… in fact I love walnuts in anything, so I do envy you having local ones! Looks so good! Maybe you should make a whipped cream version also! How lovely! I am currently sitting at a tea shop, and those little cakes look like just the thing to accompany my Asian-style milk tea. I think I must acquire a mini sponge cake tin. Life is short, one must make time for cake. Especially with buttercream frosting! A scrumptious post Cathy! Ah Camp coffee! That takes me back. Wasn’t it something that arose during the war? Yes, I think I read that it was given to soldiers, but it must have been earlier than the first world war even if the label is anything to go by! 🙂 Yes, making soup is an excellent way to warm up the kitchen and keep cosy in winter! 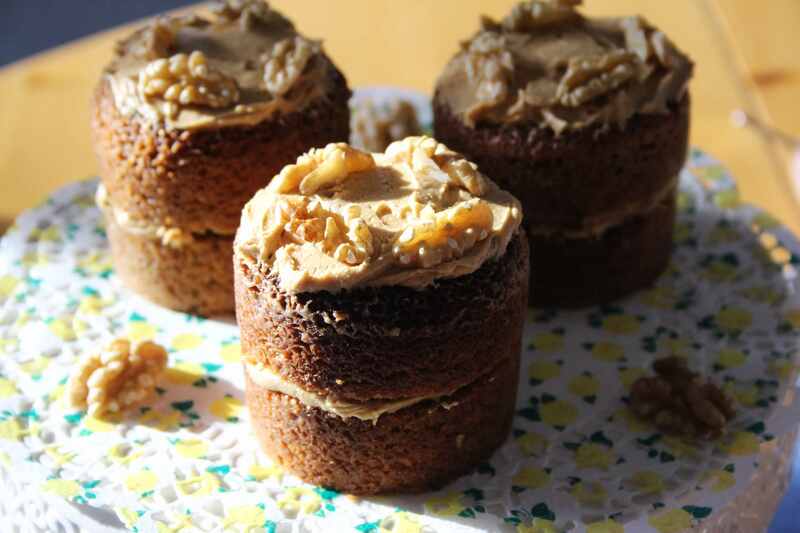 Coffee, walnuts and buttercream a very delicious combination! Oh I wish I wasn’t off sugar but I am so I indulge right now in hearty soups and stews as well as the occasional gluten-free home-made pizza. These look so yummy! I agree that soups are great in winter. They are filling and healthy and warming. I think I need to make another batch soon as the winter drags on! Oh yummy. That looks mouth-watering. Hmmm…comfort food in winter…I do like a good hearty soup, and pasta dishes.